Pollution, overcrowding, global warming, species extinction — everyone knows the Earth is in trouble. Is there anything we can do? Our book Acting for Nature tells the remarkable stories of 15 young people from around the world who didn’t get discouraged. They saw environmental problems in their communities and found ways to solve them. Judith and Miriam, two 13-year-old girls from Spain, organized a march of students, teachers and parents to call for a cleanup of their local river, the Ebro. Caroline is an 11-year-old English girl who loves owls. She convinced the local telephone company to build “owl boxes” on telephone poles. Vincent, who grew up in the slums of Nairobi, leads other youngsters on nature walks. Aishah, a 9-year-old girl from Saudi Arabia, works to improve the harsh desert habitat that supports the endangered ibex. Christian, from Palm Beach, Florida, patrols the beach in the morning to rescue hatchling sea turtles that have lost their way. Their adventures, and those of the 10 other young people in the book, are easy to read. The illustrations that go with them are realistic drawings of people and animals. Together they make a book that you’ll enjoy — not just today, but always. 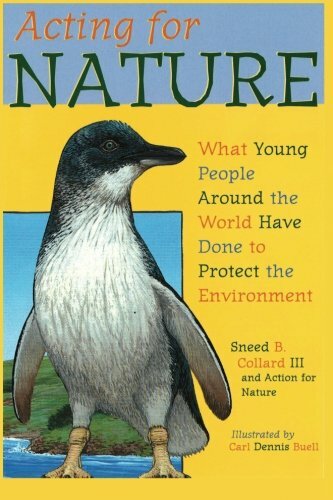 Acting for Nature was written by Sneed Collard III, author of Creepy Creatures and Animal Dads. Carl Dennis Buell, a dedicated observer of nature’s creatures, did the drawings. And Heyday Books, renowned for its works on nature and folk arts and crafts, is the book’s publisher. To buy the book, please go to Amazon.